I like how Hattie’s story about high school memories concludes with her teacher Mrs. Hayre. I bet neither Aunt Lena (see Bernice’s heartfelt tribute to her aunt in the previous blog post) nor Mrs. Hayre knew what a big difference they were making in the lives of little Bernice and teenage Hattie. These stories are proof that the goodness of good people really live on. My high school days were some of my best days. I was mostly involved in Student Government, following in the footsteps of my older sister, Dorothy Lee. She was president of the Student Association when she graduated. I made it up to Vice President and had the respect of my fellow students but more importantly their friendship. These were fun days. My teachers were role models and were very influential in my future. I loved school and never missed a day. I was cited for perfect attendance for 12 years. If I stayed at home, I would have had to do chores. There was a method to my madness. The teacher who had the most influence in my life was “Mrs. Hayre” my 9th grade advisor and English teacher. She later became Dr. Ruth Wright Hayre, Superintendent of School District 5. She was a beautiful mentor. If there is ever a story about a lifetime of gratefulness, here it is. Me and my twin sister were born in Bridgton, New Jersey, on June 18th, 1933. The doctors said I would not live another day when my aunt came to take me home. She took good care of me. She was a church woman. She believed in her god. Because of that I lived to be the mother of 11 children, 10 grandchildren, and 8 great-grand children. I am grateful to God and my aunt. I made it. My aunt was a loving person. I miss her today. She died at the age of 51 – in those days, that was old. She loved her niece and nephew. My aunt was born in 1900. If she had lived she would be 103 years old. She died at the age of 50 years and I myself have lived to 76 years old. I thank God for it. I hope to see 77. God is the head doctor. This is written to the readers: Please, readers, log on and tell me exactly what you all want to read on www.thebestdayofmylifesofar.blogspot.com. Thank you all. I was just nominated as Representative of the writing class today. So please blog me so I can share you words, as I represent the writing class at the Senior Center, thank you. Wish me luck in my representation of the Philadelphia Pennsylvania Senior Center’s Writing Class Thursday 1pm to 2pm. The growth of this project is not a script that I could have written. Gosh, even in hindsight, it’s too nuanced to spell out. There’s the hard work of my trusty volunteer team and the support of other community organizations; the deep sense of unity and friendship in our weekly class; our rapidly broadening readership (thanks to YOU GUYS!! ); the touching relationships that have developed between the seniors and their family members, whether in or out of town,… I didn’t expect any of that to grow so big so fast. But maybe what I expected the least of all is the transformation of the seniors’ personalities. With each story they share, it’s as though their smiles raise a little higher, they dress with more flair, and even their walk carry a cooler, more confident swagger. Honestly, I swear the seniors’ cheeks start to glow. Bernice, for example, used to write about war and only about war, week after week. But after a while, it’s as though she got the bad stuff off her chest, and now she writes with riotous humor (she makes me laugh so much!) about everything from her first date with her late husband, to the aunt who raised her with unconditional love, to silly memories of school dances and boys, to beautiful observations that it’s good that people are different, just like flowers. Or for example, Mo used to come to class repeating week after week that he had never written before, and telling us that he had only cried five times in his life. Now he can fill pages with vivid detail in minutes, and well, I’ve seen tears in his eyes a few more times than five. But no one has changed more than Henrietta. The first time I met her, I remember noticing how guarded she was. I could hardly get a word out of her. She was shy. But then soon she started opening to our class and blogreaders through soul-baring poems and letters, and soon she started blossoming in real life. She laughs all the time now at everyone’s jokes, and gives her classmates compliments. She even wrote a thank-you letter to the class (see “Henrietta (The Letter I Never Wrote)” under March in the Blog Archive) which moved me to tears and sent me straight to the Kleenex box. I wanted to tell you all this because, guess what, our class has unanimously voted to have Henrietta be our Class Representative! This is a role we never had before. Henrietta will represent our class in meetings with the staff and community at the senior center, as well as relay blogreaders’ feedback via Facebook and email to the other seniors. Sorry I took such a long blog post to break the news to you, but I guess I just really want you to know how proud I am of Henrietta, our brand new Writing Class Representative! We're Feelin' Warm and Fuzzy! Superkind words by First Person Arts about our project. Thanks Rudy, Karina and everyone else at FPA for your support! 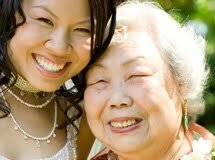 It’s awesome that this blog has become a forum where our seniors can express their pride for their family members. Sometimes, it’s hard to say things like this in normal day-to-day conversations. One of the best days of my life was one sunny afternoon when we got into the car and took a scenic ride to Rosemont, PA.
Everyone was in a good frame of mind and seemingly very happy. It was May of 2003 and we were on our way to Rosemont College for a graduation exercise. This was a proud day for Karen Leslie because at age 50, she received her BS Degree in Business Administration. BTW isn't it cool for Hattie to say "growing up with" rather than "raising" her children? I really respect that. Karen Leslie was the first-born. It seems that it took a long time for her to speak in sentences. She always had whatever she wanted and was quite satisfied. As she grew up and started school, her first grade teacher was concerned that Karen stayed to herself and did not seem to know any of her classmates. When I looked around the classroom I saw most of the children were our neighbors and often stayed at our house. Once I thought I would punish Karen for being stubborn. I said, “You cannot go to the movies.” I paid a neighbor to take her to the movies most Saturdays. I said, “Go to your room!” I felt badly about it, but I had to “punish” her. Karen told me years later that she loved to go to her room, be alone and play with her many, many toy and we thought she was miserable. Five years later, Kevin came along and he was a bright, beautiful baby. He got a lot of attention and Karen seemed to like him okay but she still had her space and she didn’t have to share anything with him. Kevin demanded his space and when he didn’t get it he would cry. He was a cute boy and had lots of love. I will write more about him sometime. When he was a year and eleven months, here comes his baby brother Keith. Looks like Beatrice and I aren’t the only ones who miss our friends from school! I can just imagine this group of teenagers walking home together every day, chatting their worries away. Something about this story - the way Helen tells it, I think that's what it is - just oozes trust and loyalty, and I love that. My childhood days were happy ones. Even when I entered high school I was still looking forward to the next day. I thoroughly enjoyed being with my family but it was really nice being with my three close girlfriends Pearl, Christine and Catherine. We didn’t have any classes together because they had other courses like home economics and commercial courses. I had academic courses. After school we would walk home together. Catherine lived on Chestnut Street and Pearl, Christine and I lived in South Philadelphia. After graduation we remained good friends but our hearts were broken when Christine moved to Washington, D.C. and Catherine moved to New York. Pearl and I remained in Philadelphia. Over the next few years we would meet in Philadelphia, Washington or New York. Needless to say, our reunions were always too short. It’s spring, and besides, Mo’s tribute to Joey in the previous post made me think we gotta talk a little bit more about friends! Spring is for friends! As someone who’s moved around from city to city all my life, it’s always bittersweet for me to think about all the friendships that I’ve made and miss. I try, I try, I swear, but it’s really impossible to keep in touch with everyone on a daily basis. And so, I want to dedicate this post to my group of friends from grad school. We did everything together, including some ridiculous things: snowball fights, grape aiming contests, shopping cart rides, and oh, studying ;) Now, we’re “grown” and scattered in different places all over the world – Philly, LA, Spain, the UK, the Netherlands, France – but I’ll never forget what a fabulous time we had! I miss you guys! Going to school was the best thing to do. I loved school. You got a chance to go out. I had lots of friends in school. Everyone has a best friend. My best friends name was Alice. We always met at the schoolyard. We would walk home together. When she was absent I would feel lonely. We also ate lunch together and would go out for recess, which was the best thing at school. You had a chance to play with other kids from the neighborhood. After writing and before reading out loud, Mo said, “I wanted to get this written so Joey’s kids can read this on the computer and know this about him.” Mo’s cousin and friend, Joey, is 77 years-old-strong. “He still goes out fishing all the time,” Mo added, visibly proud of his cousin’s love of life. Keep fishin’ and being you, Joey! What an awesome friendship you share with Mo. Did you know how much Mo has looked up to you all these years? Being an only child, I could have had a sheltered childhood. But once I could walk, my cousin Joey came to our house to take me on adventures. As he was 3 years older and my parents had great confidence in him, we went everywhere. Sometimes, later on while playing on the neighborhood streets, a bully would start messing with us by saying mean things or pushing us around. Next thing, Joey would be standing over the punk and telling him to leave me or us alone or have his “head beat in”. As we grew, I would watch him play football, basketball and baseball and join in when it was a “pick up” game. Joey was my idol and showed me how to make and keep hundreds of good friends. At age 17, when he graduated high school, he joined the US Navy for 4 years. I had just finished eighth grade. It had been a great run! Starting to notice a trend – are you seeing it too? A lot of the seniors are sharing stories about being in a bind but making a good situation out of it. To me, that’s real courage, that’s real perseverance. Well, you saw Teddy’s heartwrenching story in the previous blog post, about how he ended up in a wheelchair. And now, here’s his best friend Arthur (Arthur’s words: “I’m Teddy’s black twin.”), talking about an unexpected discovery… this one wrenches my heart just a little, but then warms it right up. The best thing that happened to me. Last Sunday I was going to church. My finances was gone and I started to not to go to church because I did not have money to put into the offering for church plus I did not have any food at my house. Well, I went anyway because of the choice I had to sing. We had to sing. When we got off the bus on our way to church we went past the playground and when I looked down on the ground by the fence I seen a 20 dollar bill just looking up at me saying, “Come and get me.” Thank you Jesus, I said, That was a penny from Heaven. That day I put in ½ in the offering and bought me a dinner platter. I was so happy. In the evening the ice cream man came around. We was so glad when they came. Ice cream was 5 cents a cone. This story is about a devastating event, but the moral of the story itself, I would venture to say, is an uplifting one. Hearing this story was an especially moving experience for me. Because Teddy cannot control his hand very well, he told me the story verbally and asked me to write it down on paper for him; because my scribbles were rough and he cannot see very well, he asked me to read the story out loud to the class. While I was reading, I would stop between paragraphs to make sure he was ok (emotionally) before I moved on. Every time I looked, he was nodding, slowly, reflectively, yet confidently. This event is the kind that tests a person’s character. I knew Teddy is a bright, friendly guy before hearing this, but this story has shown me the true measure of his smile. In 1993, the singer Charo wrote me a letter and asked me to go to her 50th birthday party at her nightclub in Hawaii. I agreed and when I went to Hawaii I went on a culture tour. There were two buses of us and we went to the mountainside and deep into the woods. After getting off of the bus we started roaming around but we were told to stay on the road. They weren’t any signs telling us anything was dangerous. I saw these beautiful reda, yellow, orange and green plants, which were humongous. The colors were almost metallic and they drew your attention. I should have known the metallic colors were a warning that these plants were dangerous. I actually stepped on the roots because I was too bust looking up. The roots stung my foot. I didn’t realize at the time that it was shooting toxins into me. The tour guides asked me if I was okay and I said I was fine. There was a little cut on my ankle but I had sandals on so I didn’t think anything of it. Two years later I felt something. I was up and down the stairs and my legs started to buckle. I was 47 so I just thought I was getting old. But at the same time, my doctor told me I was developing diabetes, which affects your legs and feet. So I just thought that’s what it was. Wrong. Soon it was getting into my neck, into my sides and even my eyelids. As years went by it was getting worse. The doctors couldn’t figure out what it was. They gave me x-rays and MRI’s and they saw that my insides were inflamed. For 5-6 years I walked with a cane and then ended up in a chair. The doctor said “The good news is it won’t kill you, the bad news is you’re gonna wish it did. The pain that comes with this is excruciating.” If the tour guides knew what it was and took me to the hospital, I could have gotten detoxed that day. Now I have a choice. I can sit in this chair and cry or I can sit in this chair and live my life and make everyone else happy. Be on the positive side. For today’s blog post, I thought I’d invite my new friend and volunteer Jonathan to say a little something about his experience of this project. As our volunteer team gets bigger, I’d love to have you meet some of the diverse personalities that help me make this project possible. With ages ranging from the early 20’s to the late 60’s, and professions ranging from law, finance, theater, design, non-profit, business to government, our team is quite the cross-section of society (notice that I didn’t say Philly… heehee, more on that in a separate post.) It’s a real pleasure to work with all of them and learn from each of their strengths. Jonathan is a media studies grad student at Temple, a writer for a financial firm and a tutor/teacher at an after-school program in South Philly, and when he is not working or hitting the books enjoys playing pick-up basketball and practicing guitar. With the temptation of sunny spring weather and everyone hitting the highway for Easter weekend, Benita warned me before my first visit: "Today might not get too busy." She was right (sort of!) A crowd of four friendly seniors — Teddy, Beatrice, Helen and Arthur — jammed together last Thursday afternoon, filling the cool, basement room at the PSC with warm laughter and memories… and then more laughter. The banter carried on for more than an hour and a half, and what at first seemed like a lazy, not-too-busy afternoon turned into a spirited sprint of storytelling and wisecracking, from Beatrice reminiscing over the milk man and tracing her famous family tree, to Arthur savouring his favourite recipes from yesteryear. Chicken liver stew or pig's feet, anyone? And for a most heartbreaking story, make sure to check back Friday to hear from resident showman Teddy, also known as Arthur's playful "twin" and comedy partner. First impression? The seniors really light up the room with their humor and their eye-opening experiences from our city's history, some never told or heard to this day. There is no doubt that these stories promise to bring laughter and life lessons to everyone in the community, young and old. And that is kind of cool. Below are some events our project is supporting, hosted by other Philly organizations that we are proud to consider our friends. (Yes, some of my volunteers and I will be there, and it would be nice to say hi to you in person!) For details, please contact the hosting organizations by clicking on the links below. Why go: Great way to brainstorm about what YOU can do for seniors, regardless of your profession. Why go: Stories on stage + a fun time! Why go: I'll be speaking as a panelist, and would love your support. Ooo also! If you live in Philly, don’t forget to pick up the June issue of Milestones Newspaper, coming out on June 1st… you guessed it, there’s an article about our project in there! Actually, got another minute for one more? I’ve got another story of Bernice’s that she wrote several weeks ago that hasn’t made it to the blog yet, but would be perfect to share back-to-back with the previous post. This is an imaginary letter she wrote to her long-lost friend Jones, a boy she once thought was interested in her (because he would sit by her in the lunchroom every day) but Bernice later found out he was really only interested in her food*. It’s amazing how such a short letter can be loaded with so much memory, humor, excitement and pain. You were my good friend in high school we went on a school trip. You were a nice person. We had lots of fund going to the zoo and parks. We went on a lot of school trips. We had to bring our own lunch. It was fun seeing you. I will not forget our high school years and the fact that we have lost a lot of high school friends. *I don't know how she is so convinced by that, by the way - she just was and she just is. So that part of the story is funny too - who knows, the boy could've been interested in HER all along! Going to high school was fun. The boys were very nice, but some were mean. They wanted to fight all the time. Some boys would walk you home and were very nice. Sometimes they had school plays and the boys were good actors, and one of them walked me home. But somehow I got into a fight. My father did not like it. Somehow I got a black eye and could not see my way, but all he could see was the boy with me. In those days, they did not go for it. I was in a fight with a girl who was in school with me. It was fun talking about the days we were in school, and to see some of my school mates. I also saw one of my 4th grade teachers not long ago. (I bumped into him at the mall. He said, “Bernice?” I said, “I am 76 years old. How old are you?” He said he was 90 years old.) He was a lot older, his name was Mr. Johnson. I was glad to see him. Easter was approaching and I was so excited! My husband and I had been married on the 28th of February, the very last day of the month. Since my husband was in the U.S. Army, he was stationed in Camp Stewart, Georgia. We were allowed to stay in the nearest town, Savannah, because my husband was a master Sargeant. He would come to our place every evening as if he were employed at the camp. When my husband sent for me to join him in Savannah I had never been to the South before, so I felt somewhat nervous, although I was ecstatic about joining my new mate. So that I wouldn’t be lonely during the day, my husband’s army buddy arranged to have his bride join him. Louise, her name, was from North Carolina. She was a very sweet girl and we were compatible right away. I had heard about the discrimination in the South, but I felt more at ease with Louise. When we went into town, we went to the back of the bus. Inwardly, I seethed, but I was not the type to make a scene. When we entered the shops (my husband had told me to purchase an Easter outfit) the sales persons were very polite. There were separated dressing rooms. The one we entered had “Colored” over the doorway. This was ridiculous because you bought what you tried on. The sales persons chatted with us, asking where I was from. I answered in a polite way because they were nice. Louise was very comfortable because she was used to the laws of the South. When my husband came home that evening I showed him my new outfit and hat. He said they were pretty. I can remember exactly what they looked like. The suit was lilac and so was the hat (a pillbox with veiling over it). The blouse was white with a lace collar and cuffs. My gloves were white lace. When we arrived in Philadelphia, we rode to my parent’s home in a cab. You can imagine how happy my parents and my sister were to see us. And, my in-laws had come down from Lancaster! There was a sumptuous dinner and happiness all around. During the next week we motored to Lancaster and spent a couple of days before going back to Savannah. What memories!